Even before you’re done, jump ahead and write what you’d like to see in the press once your novel is published. How would they describe it? Not just that it’s awesome, but why and what it’s about. It’s basically a roadmap built on aspiration. You can do the same thing when thinking about your ad campaign. Write a case study for it. Even before you have it figured out, see if you can write what you’d like the case study to be. What was the problem? Your insight? Your solution? You’ll be able to tell pretty quickly if you’re idea’s simple and if you actually know what you’re trying to achieve. You’ll also be able to see if, once all is said and done, you’ll actually have a compelling story to tell. AICP judges on integration. Definitely worth two minutes of your time. AICP NEXT 2011 from Joe Gabriel on Vimeo. If I were a student in portfolio school, I’d probably skew toward the digital/integrated ideas, too. Done right, they’re cooler, more memorable, and it’s the direction the industry has been heading for about a decade now. And we’re thinkers and concepters first and foremost, right? But here’s the catch: speaking for the majority of creative directors and recruiters, the best way for me to judge your talents is with an unsexy, unglamorous old school medium: a print ad. If you’re a copywriter, a bunch of headlines and scintillating body copy lets me know you can write. If you’re an art director, a double-page spread is going to tell me more about your skills and artistic judgement than a big idea blown out across six media channels. BOOK #1 contains several digital pieces with their accompanying explanations, a couple integrated campaigns with their accompanying explanations, and a billboard campaign. My reaction: Wow. Some pretty cool ideas in here. At least I think so. I didn’t take the time to read through all the explanations. BOOK #2 contains several print campaigns which might even be a part of one or two integrated campaigns, a couple digital pieces. My reaction: Wow. Some pretty cool ideas in here. And this kid can really write/art direct. We could use them here. Multiply Book #1 by about 20, and Book #2 by three or four, and you start to see why having big ideas on their own might not be enough to get you a job. You need to be a big thinker. And digital and integrated campaigns are usually the best way to show off your brain. But agencies don’t hire big thinkers. They hire writers and art directors who think big. And as unsexy as it sounds, the best way to show off your craft is usually a double-page spread. Sure, roll it into your integrated piece if you can. But don’t assume one print campaign is enough to showcase your talent. How Campaignable is Your Campaign? There are people who would argue, and probably rightly so, that the “new media” makes the traditional concept of campaigns less important. Used to be that it was really important that all of your communication worked together, looked the same, had a “big idea.” Now you can get away with putting out a bunch of smaller ideas and hoping one of them takes off. Still, it’s nice to see when an idea is campaignable (I look for at least a few examples of that in a student’s book). 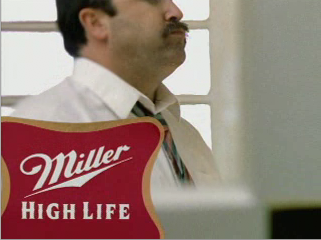 This morning, I came across the full set of tv spots for the classic Miller High Life campaign on director Errol Morris’s website. It has 80 spots. 80! This campaign is one of my favorites, but I was shocked to see how many they’d produced. ESPN Sportscenter also comes to mind as great, long-running campaign. Do you have any favorites? OK, fine, I’ll elaborate. But just a little bit. No reason to overthink things here. You see a TV spot, you know what it’s for and what it’s trying to do. Sell yuppies more boat shoes. Get moms to upgrade their laundry detergent. Convert teenage girls from that shampoo to this one. Digital campaigns, on the other hand, are rarely one and done. Blame integration. A banner begets a Facebook fan page begets a web app begets a microsite begets an online contest that begets three web pages to register and enter. It’s tempting to figure out how to incorporate every social network and technology under the world wide sun. But that doesn’t make an idea better. It makes it more confusing. Every added step is another burden. An obstacle in the way of your message. Squeezing too many moving parts together doesn’t make a better-running machine. It makes a campaign that’s more likely to break down. Digital campaigns need to be accessible. They shouldn’t require a bachelor’s degree and twenty minutes. When creative directors are flipping or clicking through books, they want to see brilliant thinking, writing and art direction. Not case studies. Take this Movie Maker for Sprite. It’s ridiculously easy and it’s fun to play with. It’s not intrusive. You can explain it in five words. Don’t confuse complex with smart. And don’t mistake simple for dumbed down. It’s hard to do easy. In digital, it’s very hard to do easy and cut through the clutter at the same time. That’s what I like about this banner ad for Toyota. What it sacrifices in mindblowingness, it makes up for in effectiveness. Is it intrusive? Not at all. Fun? A little. Interesting? If you’re looking for an AWD vehicle, it is. The best idea is one that has been boiled down to its most basic essence. Not watered down by whatever technology or social network is getting the most buzz. Just because everything on the web can be connected doesn’t mean it has to be. If people had to press a button and fill out a form to see puppies, pet stores would end up with a whole lot of dogs. What I’m trying to say is when in doubt, cut it out. Sorry that took so long. This is the fourth in a series of guest posts by our pal Nate Archambault on his transition from traditional agencies to digital. Follow Nate on Twitter@NKArch. Last week I recounted how interactive freelance projects set me up for the switch to digital. The lesson, if any: you’ve got to be focused to land the job you want. This week I’m going to talk about how digital ads come from a different place than traditional ones. Digital agencies start with a digital foundation. They’re not founded by general agency ex-pats who wanted to give the next big thing a shot. They’re start-ups founded by people who were born and raised digital. HTML is their first language. A true digital shop is not an evolution of the traditional agency. It’s a whole new model. There’s no age-old battle of Creative vs. Account. Work developed at AKQA comes from an equal combination of Creative, Account, Strategy, Information Architecture (IA), User Experience (UX) and Technology. Everyone works together like one big pixilated family, and each discipline’s expertise helps create stronger product for the agency. The age of integration is far from over. Integrated agencies are great in theory, but the practice is far from perfect. We’re in the midst of the first generation of integration. There will be growing pains. Some can pull it off, but most efforts fall a little short. Traditional agencies try to build interactive work with a traditional toolbox, and the nuts don’t always fit the bolts. At the same time, clients are starting to trust digital agencies, giving them a chance to produce offline work. There will always be some agencies that focus on digital or traditional, while others adapt to do all things for their clients. One of the first projects I worked on at AKQA involved more print, billboards and POP than digital work. But what did all that traditional media do? Lead back to a mobile site. Our work isn’t limited to the computer screen. It’s limited to the best medium that communicates what our clients want to say. Concept is still king, but tech is crown prince. While most traditional ad agencies outsource production, most digital ad agencies have in-house tech talent capable of pulling off amazing work, no outside vendor needed. If crowdsourcing has taught us anything, it’s that just coming up with an idea isn’t enough. If an agency is going to succeed, it must know how to actually do something. When I worked in general agencies, producing in-house was a last resort. It didn’t matter if I was recording radio, editing video or folding fitted sheets; top-quality production value wasn’t there. That all changes when tech gets a role in the creative process. Then the talent comes in-house and becomes a strength, not a weakness. Pixels have more flexibility than paper. One of my favorite qualities of working in digital is that if I can dream it up, my agency can bring it to life online. Digital ads aren’t limited to predictable formulas like print and TV. There are expandable rich-media banners, site takeovers and microsites. Mobile sites and mobile apps. Social media strategies that span Facebook, Twitter, YouTube and Flickr. Viral, seeded, user-generated and branded content. Flash animation, video-tagging and augmented reality. These examples are already out there, and digital work continues to break new ground every other day. More often than not, the only boundaries of a digital agency are the creative team’s imagination. Out with the obtrusive and in with the engaging. Content that hunts down and interrupts the viewer doesn’t cut it anymore. People have too many options of how to consume media. If content is going to succeed, users must choose to spend time with it. Good digital campaigns blur the line between ad campaign and product, like how this Smirnoff media player gives DJ Tiesto fans more of what they want. Interactive can be a tool, offering functionality and serving a purpose beyond pitching a brand. The ultimate goal of any campaign that lives online should be to empower the user. The digital process starts with the consumer, not with the product or media buy. That’s what makes it so effective. These are just a few of the ways that digital agencies operate differently than traditional ones. If you’ve noticed others, drop a note in the comments. Next week, I’ll go over some things I’ve noticed about how the role of a creative in a digital agency is different from a creative’s role at a traditional agency. Until then, make yourself familiar with this list of the top 20 digital campaigns of all time. There are few things as inspiring when looking through the awards shows than amazing ideas executed in ways you’ve never seen before. The Mini launch is a great example of creative media executions. There are countless others that are newer. These campaigns often include complex installations and things that have never been done before, so a lot of explanation is often required. Fortunately for agencies, they have the means to produce submission videos to award shows to demonstrate the breadth, creativity and sound business results to accompany these innovative campaigns in a clear, comprehensive manner. My agency actually has several people dedicated to this job. The target audience for your book is a busy group of people. Campaign after campaign of lengthy description multi-media onslaughts may not always be the best approach. But sometimes, I just want to know you can knock out some killer print ads or OOH or posters or something I can look at for 10 seconds and think, “That’s cool,” and doesn’t have a gazillion moving parts. Before you blow out every single campaign in your book, make sure it calls for it. Make sure your book needs another blown out campaign. (I’d say two is the maximum amount I have the ability to fully take in.) Above all, make sure the ideas are great. Show you can do something with legs. Show you can do things no one’s ever seen before. Show you’ll bring something invaluable to an agency. But make sure you also, in easily digestible format, show that you can make a traditional ad campaign. Because once you start working, you’ll have to make good old fashioned ads. Give Peter some love (or disagree with him) in the comments section. You can also get in touch with him at peter_carnevale@gspsf.com.